Did you know that you can simultaneously improve your posture, stabilize your knee and hip joints, and relieve your lower back pain by engaging the trio of muscles that make up the gluteals? Primary among these muscles is the under appreciated “emperor” of postural integrity, gluteus maximus—along with his retinue of the deeper gluteal muscles: gluteus medius and gluteus minimus. These gluteals play a vital role in the health of our lumbar spine, sacrum, hip joints, and knees—when and if we use them properly. If we don’t (which is quite often the case), the result is joint problems as well as overdeveloped and tight hamstrings. First, let’s take a look at the anatomy of the gluteals. Then we’ll learn how to work these muscles to our advantage in some valuable yoga poses. There are three sets of layered gluteal muscles, and they have a variety of complementary functions. The main functions of the gluteals are performed by gluteus maximus at the outermost layer. Gluteus maximus is a hip extensor: that is, it takes the thigh back behind us, stretching the front of the hip. It also laterally rotates the hip, making the thigh turn out. Both of these actions are integral to the simple act of walking, and if gluteus maximus is not allowed to do its job well, other muscles—notably the hamstrings—have to compensate, becoming tight and overdeveloped in the process. ​Gluteus medius has the task of stabilizing the thigh bone in the hip socket when we put weight on the leg. For instance, when we balance on one leg in poses such as vrikshasana (tree pose) or hasta padangusthasana (hand-to-toe posture), gluteus medius keeps our hips level and keeps us from wobbling or tipping sideways. It does this by contracting at the outer edge of the hip (abducting the thigh) to prevent the pelvis from tipping toward the side of the raised leg. Even more important, it plays an essential role in the simple act of walking; without this muscle, we would fall over sideways each time we lifted a leg to take a step. Gluteus medius has a crescent or half-moon shape, and it attaches along the outer rim of the hip bone, extending from the sacrum at the back of the pelvis to the head of the thigh bone at the front. At the deepest layer, gluteus minimus inwardly rotates and flexes the hip—essentially the opposite of what gluteus maximus does—and thus it provides a balance of action, complementing gluteus maximus. It also abducts the hip, preventing the thigh bone from jamming into the joint when we flex the hip, lifting the leg in poses such as the hand-to-toe posture. Each of the gluteals is a “use-it-or-lose-it” kind of muscle, and unfortunately, many of us have postural habits that largely avoid the use of the gluteals, causing them to be underdeveloped. A common habit is a swayback posture, in which the hips sway forward of the line of gravity that is running through the legs (Fig. 3). To compensate for this misalignment, the knees usually lock backward while the hips tilt forward and the upper back rounds. All of this prevents the gluteal muscles from working properly. They become flat or underdeveloped, while the hamstrings—which help hold the hips and knees in this locked position—grow tight and overdeveloped. Thus the problem is twofold. The gluteal muscles come into play when the leg is weight-bearing, but they work correctly only when the leg is weight-bearing in a very specific way. We come closest to the ideal use of our gluteal and leg muscles when we walk barefoot, thanks largely to the way in which our weight strikes the center of the heel with each step. Something different occurs when we walk with shoes on our feet. Your shoes themselves will tell you whether or not you’re using your gluteal muscles properly. Inspect the heels of your shoes. You may find the outer edges at the back of your heels especially worn, which is a sign that your outer heel is the part of the foot that touches the ground first. In fact, most shoes encourage this way of walking, thanks to their raised and cushioned heels. What happens when you bring your weight down on the back of your heel and to the outside? When you flex the ankle that much you tighten the front of the shin and ankle—and as the foot comes down, it flattens the arch as it rolls inward, with the lower leg still tilted backward. This leads to tighter ankles, a susceptibility to shin splints (among runners especially), weak or fallen arches, and pain in the soles of the feet from plantar fasciitis. The knee suffers too: the angle of the lower leg tends to jam the knee into hyperextension. The hamstrings get tighter, while the front of the hip joint is stressed and weakened from the forward shift of the hips. Things change when you walk barefoot. You are more likely to come down on the center of the heel, flexing the ankle less, so that the balls of the toes are already closer to the floor. You more naturally roll your weight from heel to toes in the full course of the step, and the ankle is in a position to maintain the strength of the arches. This reduces the problems listed above, and has the bonus of engaging the gluteal muscles correctly. It is easy enough to check your own postural habits: Try experimenting with the different styles of walking mentioned above while monitoring the action of the gluteals; pinch your gluteus maximus with your thumb and forefinger to see how strongly it’s working in each case. First put on a pair of shoes and stand with a slightly exaggerated swayback posture: lean your upper body back, shift your hips forward and lock your knees, and then start walking. You’re likely to feel minimal activity in the gluteals, and perhaps heavy reliance on the hamstrings to pull you forward. Now unlock your knees with a little “microbend,” shift your hips back so you feel your weight more in the center of your heels, and take another walk. Compare the level of activity in the gluteals. If you feel more activity in the gluteals, that’s a sign of improvement. Your torso maintains better alignment by leaning forward slightly as your heel strikes the ground (rather than leaning back as it did in the swayback posture). Your knees and hip joints have a slight micro-bend, which protects the ligaments and prevents hyperextension while reducing tension in the ankles and shins. Your arches stay stronger as you roll from heel to toe when “pushing off” in your stride, reducing the flattening of the foot and the strain to the soles of the feet and ankles. When you align your hips properly, the gluteals get involved, especially playing a role in the points listed above. Then the gluteals can do their job and help stabilize the lower back, knee joints, and hip joints. Here’s how. Covering the lower back is a strong sheet of connective tissue that is woven into the muscles of the lower back, hips, torso, and shoulders (Fig. 4). It is known as the thoracolumbar fascia and forms the “rigging” of the lower back, which supports the spine, holding it up like rigging to the mast of a ship. When gluteus maximus contracts, it tightens the rigging downward in a crosswise fashion, lengthening the lumbar spine and stabilizing the sacrum, especially in activities in which the gluteals are active, such as walking and bending forward. When gluteus maximus engages, a number of other muscles also co-contract, or engage along with it—principally the quadriceps, but also the adductors (inner thigh muscles), which complement the action of the gluteals as abductors. We saw in an earlier article on knee pain (see YogaPlus.org) that one particular muscle of the quadriceps—vastus medialis—is especially important for maintaining the health of the knee. Engagement of gluteus maximus causes the co-contraction of vastus medialis, increasing the chances for healthy knees. As a result of these co-contractions (including a slight contraction of the psoas at the front of the hip joint), the head of the femur remains more centered in the hip socket, reducing overall wear and tear on the hip joint. If, by contrast, gluteus maximus is not engaged, the actions of the other muscles are less likely to support good alignment of the hip, and the hip joint itself—particularly at the front of the joint—can begin to wear down, leading to serious problems in the hip joint. Utkatasana, often thought of as a real quad-burner, is also a beneficial workout for the gluteals, and by practicing this pose, you can experience the kind of co-contractions described above. Utkatasana is generally easier on the knees than squats, and it is just as effective for strengthening the quadriceps and gluteals. 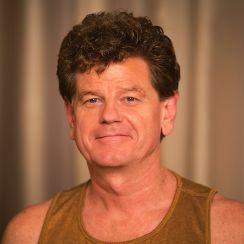 To come into the pose, fold forward into uttanasana (standing forward bend). Bring your big toes together and keep your inner heels just a little bit apart. Bend your knees deeply, allowing the inner knees to touch; at the same time, extend your arms forward, palms touching, as if you were about to do an old-style dive into a pool (Fig. 5). Lift your toes slightly to help you shift your weight back into your heels. You’ll feel the middle of your quadriceps work more strongly, and you should feel no strain across the top of your kneecaps. To bend more deeply, let your upper inner thighs melt down toward the floor. Press the center of your heels into the floor and draw your sit bones toward your heels—enough to feel your gluteals engage and your lower back lengthen from the waistline downward. When you activate the gluteals, you will feel the inner thighs firm (though they shouldn’t feel jammed—if they do, let them melt down again); the middle of your quadriceps should work more strongly as well. Draw your shoulders back and take your arms overhead for the full pose. You can experiment with this alignment in all of the standing poses. In every case, by bringing more weight to the center of the heels and gripping less with the toes, you will feel the action in the buttock muscles, thighs, and hips. The effect upon the gluteals is amplified in balancing poses, especially ardha chandrasana (half-moon pose). This is not always a popular pose because many people find it difficult to balance and often experience pinching or discomfort in the hip joint of the standing leg. These problems arise when you do not engage your gluteals enough to stabilize the hip, lengthen the lower back, and protect the hamstring attachment. If you do find that your knees lock and your lower back overarches, you can focus on activating all three gluteal muscles in ardha chandrasana. 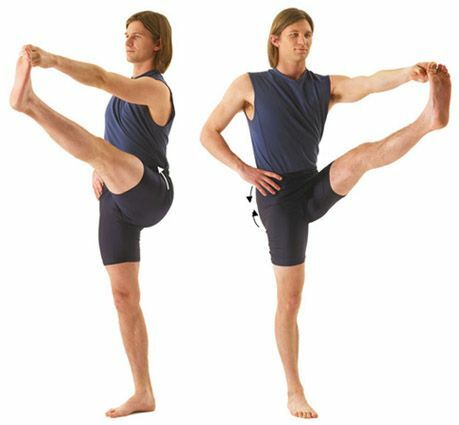 To come into the pose, start in trikonasana (triangle pose) on the left side. Bend your left knee and shift your weight forward onto the left foot as you slide your right foot back. Keep your left knee bent as you lift your right leg until it is parallel to the floor. Resist the temptation to straighten and lock the knee of your standing leg. Instead, while keeping the left knee bent, lift your toes slightly to shift your weight back toward the center of your heel. You can use your toes for balance, but don’t grip the floor with them, since this only tightens your calf and hamstrings. Press into the earth through the center of your heel and feel the response in the thigh, hip, and buttock muscles as you very slowly straighten the left leg. The muscles around your sit bone will firm and draw the sit bone down toward the heel, while the quadriceps will engage, pulling energy up into the hip. The thigh itself will rotate out just enough to keep the knee lined up with the center of the foot and prevent a feeling of pinching in your hip. Repeat the pose on the other side. You might lose your balance in the pose at first, especially if you are used to locking the knee and allowing the kneecap to turn inward. But remember that the habitual inward rotation of the thigh bone that comes with hyperextension is precisely what leads to hip pain and instability in the pose. To encourage this new outward rotation, keep the ball of the big toe and the inner heel grounded and the gluteal muscles engaged while you straighten the leg. The pose will feel lighter, your arch will stay stronger, and you won’t collapse into or pinch your hip joint. Ardha chandrasana uses practically every aspect of the layered gluteal muscles, making it an “all gluteals” balancing pose. The pose—with appropriate support for the lifted leg—is excellent for pregnant women suffering from pain and fatigue in the lower back. The feeling of length in the lower back and the extra pull that the gluteals exert on the thoracolumbar fascia can relieve the stress on the lower back that comes with carrying the extra weight of the baby. Moreover, the pull of the gluteus maximus on the fascia helps to stabilize the sacrum at a time when the ligaments are especially mobile. The gluteus maximus is used to lift the raised leg, abducting the thigh to hold it aloft. Moreover, it plays a central role in rotating the thigh of the standing leg out just the right amount to open the hip and maintain balance—and it lengthens the fascia of the lower back while stabilizing the sacrum. The gluteus medius plays a central role in stabilizing the hip of the standing leg, and together with the gluteus maximus helps you to lengthen or extend through the front of the hip of the lifted leg. The gluteus medius engages most tangibly in the hip of the standing leg, stabilizing it and bringing lightness to the pose. The gluteus minimus is at the deepest layer, covering the hip joint and attaching to the front surface of the head of the femur. It allows you to bend at the hip in the standing leg and abducts the thigh, helping to prevent the pinching so often felt in the hip joint. When you ground through the center of your heels and engage the gluteal muscles, balancing poses such as ardha chandrasana promote a well-aligned posture— the many benefits of which can be enjoyed not just in the gluteal region but throughout your body.